This is a list of 12 Christmas movies. Hope you like them. 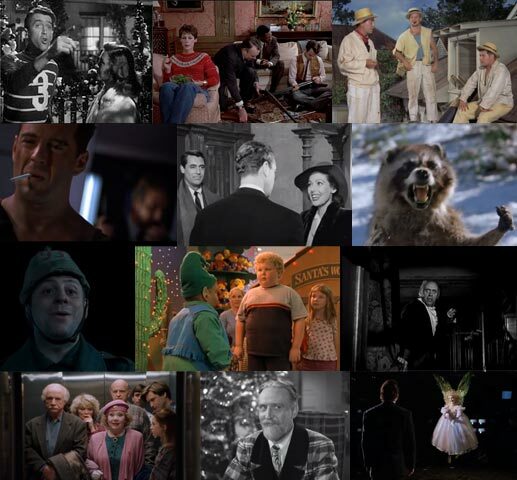 There are loads of good Christmas movies. It was a little difficult picking just twelve but hopefully this list has something for everybody. Probably not. ’tis the season to … fail to predict what exactly people want. But hopefully there’s something you’ll like. I’ve seen this film so often and I still find it funny. I love 1930s American screwball comedies. This I would call this a 1980s screwball comedy. A snobbish investor and a wily street con artist find their positions reversed as part of a bet by two callous millionaires. Three Devil’s Island prisoners escape and hide out in a shop run by a sweet but unsuccessful family and the prisoners decide to use their criminal talents to help them out. Though it may have a bishop in it, this movie has nothing really to do with religion instead it’s all about the magic of old style Hollywood movies. I love Cary Grant movies but the funny thing about this one is rather than rooting for his character you feel more for the plight of David Niven trying to compete with an angel. Or at least I do. There are so many versions of the old Dicken’s classic story of the ghosts of Christmas past, present and future teaching an unhappy and miserly man to open his heart to the joys of Christmas and to his fellow man. Being fond of black and white movies (and also I think Alaistair Sim looks perfect as Scrooge) I have picked the 1951 version but I like all versions I’ve seen of this tale. Basically a 1980s screwball comedy version of Scrooge, with a lot more irony and self awareness added in for good measure. It’s like the sweet innocent hero of a Frank Capra movie fell into a modern film. Well kinda… It’s funny. And now I want a raccoon. A popular critic used to high society breaks his hip on the steps of an upper middle class home in a small town in Ohio. He is forced to rest and recuperate a while and so proceeds to take over the household in a masterful way. I don’t remember this being in the cinema and in lots of ways it looks like something that was made for TV, not in a bad way, just in that you can see easily how to cut it up to add ads breaks to it. I found this movie because it was one of three videos in a house I lived in about 15 years ago. They had Princess Bride, the 1995 BBC adaptation of Pride & Prejudice and this movie, While You Were Sleeping. Every time I had a duvet day I’d watch these videos, or some combination of them. I watched them many times, possibly shouldn’t admit that, but I have. I wasn’t expecting anything from this one at all and it is so charming – all three of the videos were; perfect duvet day material… This has all the charm of an old fashioned Hollywood romance. I never knew it but this movie is actually a sequel. The first in the series stars Frank Sinatra and is called The Detective (1968). I haven’t seen it yet. I’m definitely going to check it out. I’ve seen the second Die Hard and it didn’t really grab me so I never watched the later movies but Die Hard remains one of my favourite action movies. I did not remember how much swearing there is in this. To get a clip without swearing you have to go with the official trailer, which is a pity because it doesn’t show how funny the movie is. It’s crass but very funny. This year is the centenary of World War I; one of dumbest and most unnecessary wars in a world of dumb and unnecessary wars. This film is about the Christmas truce, when soldiers on both sides exchanged of gifts and allowed access to the dead for burials on many sites along the trench lines of the Western Front in Christmas 1914. These acts of humanity are very touching but they also underline just how senseless and needless was the destruction and loss of life caused by this war, and all the madness that followed it. You can’t help thinking ‘why didn’t the soldiers just refuse to fight?’ but we don’t live in that kind of world even yet. I really wanted to link to a full version of the 1930s film All Quiet On The Western Front. Unfortunately it’s not in the public domain and although you can find it easily online I’d be worried about linking to a site other than youtube (or vimeo) in case there was malware on it or something. I can’t believe this isn’t in the public domain. It really should be. It’s one of the best anti-war films ever made. It’s based on a novel by Erich Maria Remarque, a German veteran of WWI. And if you’re making it an anti-war film night you could also check out Stanley Kubrick’s Paths of Glory. Among other things this movie shows why the soldiers weren’t able to refuse to fight. So nothing really new here but hopefully it will remind you of some old favourites to watch. … or whatever you’re having yourself. Want to be scared? Boo!